You all know by now that I love using cranberries in my cooking; sauce, with veggies – so good with Brussels sprouts – and especially desserts. Cranberries also add a festive touch to all your dishes. Especially around the Holidays Cranberries add a festive flavorful touch. This year once again cranberries will be the star on my holiday dessert table – from easy make ahead tea breads to an rich cheese cake and a sparking show stopping white cake. A rich cheesecake topped with candied cranberries taste delicious and looks beautiful on a dessert table. My youngest son Chad loves cheesecake; we’ve even been to Juniors in Times square to sample their array of delectable cakes. At Christmas I make especially for him a cheesecake enjoyed by all. This cheesecake is what is called a New York style – rich, five packages of cream cheese, five eggs plus two egg yolks and cream – making for a dense creaming cake. In the spring I make this cheesecake with crushed pineapple. Isn’t this a beautiful cake – looking like a new fallen snow on Christmas morning. The white cake is light and moist, one of my favorite recipes that I use over and over, just changing the filling and frosting. A deliciously easy cake, perfect after a meal, but I like to serve this cake with brunch or when sharing a cup of coffee with friends. Tea breads are great to make ahead and freeze for up to a month. I always around the holidays have a few in my freezer for when friends drop in or if I want to bring as a hostess gift. I wrap the tea bread in cello wrap which you can purchase at a craft store and tie with a festive bow. In New England we have fresh picked cranberries from fall to December. Cranberries freeze well so I buy extra to freeze and use during the winter months in my cooking. 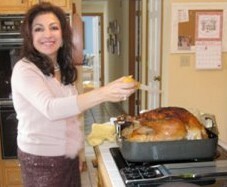 I have many recipes on my blog with cranberries!